Global Peace Women (GPW) Kenya made 40 young girls’ wishes come true when they distributed books to students at St. Thaddeus School in Komarock. Book Wish is a project that began at the end of 2016 when the girls wrote a wish list for books last Christmas. Since then, anonymous donors received the lists and sent cards attached to the eagerly anticipated books. 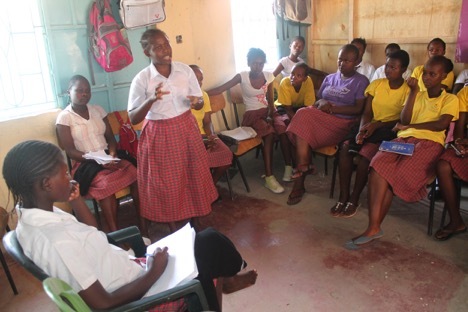 The all-girls secondary students at St. Thaddeus received their books and engaged in the monthly GPW Kenya Mentorship Program on February 11. Staff and mentors, including five female university students from Peace Ambassadors Kenya, led group discussions on the question, “What is Beauty? Self-Esteem and Confidence?” which covered topics like self-image, personal hygiene and building healthy relationships that understand the complementary differences between genders. For student Lauracia, the discussion on personal hygiene was very important. She realized that a simple routine boosts confidence and health and was a step to becoming a respectable model leader in their community. As the women’s division of Global Peace Foundation (GPF), GPW uplifts the vision of “One Family under God” through ongoing projects like the mentorship program at St. Thaddeus, strengthening intergenerational relationships that model the extended family. Older mentors serve as role models and guides for younger mentees, fostering a sense of family not only between relatives, but also between members of the community. Women and girls play an important role in the development of peaceful families and societies. 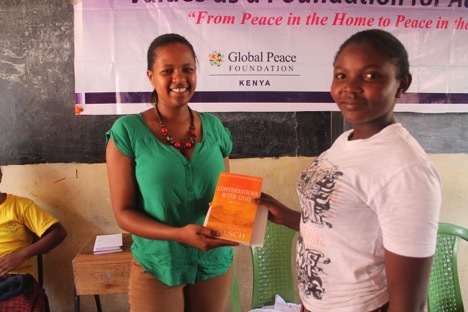 The mentorship program and Book Wish project are supported by GPW advocates Misco Mungai and Eva Muhatia of GPF Kenya. Women and girls are a vital part of maintaining a network of social support, the fibers that hold together community-based efforts that impact the greater society. GPW’s ongoing mentorship program will continue to engage students from St. Thaddeus and local universities, nurturing the confidence of women in the family, community and society. Following the successful book donation drive, GPW Kenya plans to continue Book Wish throughout the year. Discover the latest on Global Peace Women.